Because the nervous system of newborns is immature, newborns sleep a great deal, but only for an hour or two at a time, independent of day or night. By 4 to 6 weeks of age, many infants are on a cycle of waking for 4 hours and sleeping for 4 hours. Only by 2 to 3 months of age are infants capable of adopting a pattern of nighttime sleeping. 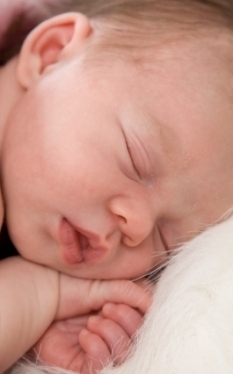 By 1 year of age, most infants sleep 8 to 9 hours continuously through the night. Parents can assist infants to sleep at night by handling and stimulating the child less in the late evening and keeping the child's room dark at night, which is important in the development of normal vision. Infants should be encouraged at an early age to fall asleep on their own and not in a parent's arms. In this way, they will be able to quiet themselves when they wake in the middle of the night. To minimize the risk of sudden infant death syndrome (SIDS), infants should sleep on their back, rather than on their stomach. This recommendation has helped reduce the incidence of SIDS in recent years. Also, infants should not sleep with soft pillows, toys, or heavy blankets, which may obstruct their breathing. The Foundation for the Study of Infant Deaths (FSID UK) recommends baby sleeping bags as a safe and effective alternative as they keep babies face free from blankets. Putting an infant to bed with a pacifier also helps prevent SIDS (breastfed infants should be at least 1 month old or used to breastfeeding before given a pacifier). Getting your baby to bed can be one of the most trying things for the new parent. When the baby is a new born, it typically dictates it's own schedule. But as she gets older, creating a schedule, and working to get the baby to a pattern can be like forcing a square peg into a round hole. Trying to get your baby or toddler to follow a routine can be a difficult task. At the same time, many of you parents are probably working, and your own schedules don't always co inside with the babies. As parents we are often busy and stopping what we are doing to provide a nightly practice can be difficult. Realize this, making that commitment to a regular schedule can make the difference in long term success with regular bed times, not to mention your sanity. Make their schedule a part of yours, then you will have time to be more consistent with them. The first thing to success is committing to it, and making sure you stick with it. It is just like going on a diet. You need to be serious, and not let other things get in the way. Stop whatever it is you are doing at least one hour before trying to put your little ones to bed. If you do the same thing with them every night, their minds and body will adjust to the schedule. The key is to keep to the regular schedule. It's just like the idea of jet lag. When you break your regular routine, don't you go nuts? You can start by giving your baby a warm bath. A nightly bath will let them know that things are winding down and it is almost bedtime. For toddlers, give them a few minutes to play and let them get their wiggles out. The warm water also soothes, and starts the relaxation process. After a warm bath, get the child in the bedroom,in bed, and read them a story. Even if your child is under the age of one, they can still listen to stories. Take care that your child is warm enough after you have dressed him/her in pajamas. Putting your baby into a Napsack Sleeping Bag will help establish bed & sleep routines as baby associates their Napsack with bed time. Napsacks also help prevent sleep disruption as baby will not wake up cold after kicking blankets off, thereby maintaining existing routines. Babies can go into a Napsack as soon as they are no longer being swaddled (more than 70% of new babies in the UK are in sleeping bags after swaddling). Make sure the setting in the room is quiet, and the lighting is soft. Minimize distractions in the area. Often, the sound of your voice will soothe them and let them know that they are safe. Toddlers love to let their imaginations run wild. A good story before bed helps them use their mind and this can help them settle down as well. Make sure you don't pick a scary story, as that imagination will cause the child to have nightmares, or worse yet, not be able to fall asleep. Just remember to read something that is relaxing, and with a happy ending. If you know your child is going to get out of bed and declare that they are hungry, make snack time a part of your routine as well. This way, you know that there are no excuses from them. The idea is take care of all their needs before getting them in bed. Warm milk is a great item to help relax the child. Keep in mind that you want to take care of the eating before the brushing of teeth, to prevent food and sugars from sitting in the mouth overnight. The reality of the situation is that a constant and regular schedule is what is going to win. Make sure that at the same time every night, you go through the routine, and you also create the quiet time toward the end of the evening. When things start to wind down, then you will also see things start to wind down with your baby.